Reggie Wayne was born on the 17th November 1978, in New Orleans, Louisiana USA, and is a retired American Football wide receiver, best known for playing for Indianapolis Colts his entire career. One of the best receivers ever, Wayne was in the team that won Super Bowl XLI, was selected six times to the Pro Bowl, is ranked seventh all-time in NFL career receptions, and eighth all-time in NFL receiving yards. Wayne’s skills on the field certainly helped him to build his net worth. His career started in 2001 and ended in 2014. Have you ever wondered how rich Reggie Wayne is, as of mid-2016? According to authoritative sources, it has been estimated that Wayne’s net worth is as high as $10 million, most of his wealth earned by playing football at the professional level, but also appearing in various commercials additionally improved his wealth. Reggie Wayne is the youngest of Ralph Wayne’s three sons. His father was a linebacker for Grambling State, and Reggie was a big New Orleans fan, but he loved to play baseball more than football, however, he opted for football when at John Ehret High School. Wayne attended the University of Miami where he roomed with Ed Reed, the future Baltimore Ravens safety, and was a star player for the next four years, setting college records with 173 catches and was one of the five wide receivers in history to record 20 or more touchdowns. Wayne was also a runner, setting a personal record of 21.87 seconds for the 200 meters. Reggie graduated with a BA degree in 2001. The Indianapolis Colts selected Wayne as the 30th pick in the 2001 NFL Draft, to play alongside superstar receiver Marvin Harrison. The duo created perfect chemistry with quarterback Peyton Manning, and the Colts were one of the best teams in the 2000’s. In his rookie year, Wayne wasn’t very impressive, recording 27 passes received for 345 yards with no touchdowns. He was better the following year with 716 received yards and four touchdowns. Wayne’s third season was a breakthrough, establishing his starting spot in all 16 regular season games, and recording 838 yards and seven touchdowns. In 2004, Reggie recorded had his first 1000 yards season, catching 77 passes for 1210 yards and 12 touchdowns. He had seven more seasons with over 1000 yards after 2004, with the 2006 season the most influential in his career; he signed a 6-year, $39.5 million contract, which certainly increased his net worth to a large degree, after recording 86 caught passes for a career-high 1310 yards and nine touchdowns. The Indianapolis Colts won the Superbowl that year, and Wayne was a significant contributor, with a 53-yard touchdown in the opening quarter. He was also selected for the Pro-Bowl for the first time in his career. Wayne led the NFL in receiving yards (1510) in 2007 and was selected to another Pro-Bowl. He continued to appear at the Pro-Bowl in 2008, 2009, and 2010. In 2008, the Colts got to the Super Bowl XLIV, and Wayne had five catches for 46 yards, but Indianapolis was defeated by the New Orleans Saints 31-17. Indianapolis opted to re-sign Wayne to a three-year deal in 2012, and Reggie formed a great partnership with the rookie quarterback Andrew Luck. He finished the season with 106 receptions for 1355 yards and five touchdowns. In the middle of the 2013 campaign, Wayne tore his ACL and missed the rest of the season. 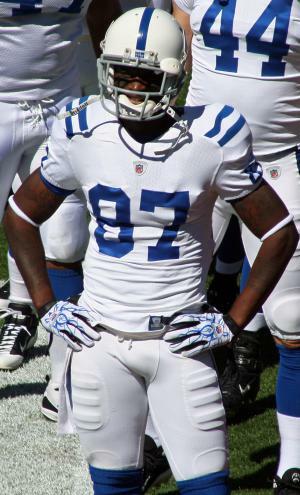 Reggie played his last season with the Colts in 2014, after which the club decided not to renew his contract, so he became a free-agent in 2015. Wayne signed a one-year deal worth $3 million with the New England Patriots but requested to be released before the season started. He announced his retirement in January 2016. Regarding his personal life, Reggie Wayne has been married since 2014, and has children, but details aren’t public as he and his wife wanted everything to remain private.